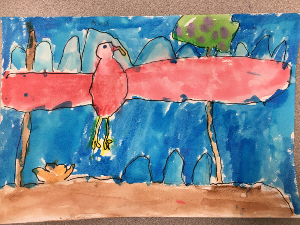 Lenski students receive art instruction in the classroom from full-time art instructors who instill in them the elements and principles of art. Curriculum is established with regard to Colorado State Standards and encompasses realistic, abstract, and nonobjective artwork with intermittent lessons on famous artists in history. Art projects utilize a variety of media: tempera, watercolor, ink, acrylics, clay, metal and wire. Projects are made into drawings, paintings, weavings, mobiles, sculptures and prints. As you walk through Lenski’s hallways, you’ll notice the innovative and creative student artwork exhibiting a year-round art show enjoyed by students, faculty, and visitors alike. Looking for one element in a painting that is different from the rest. How is it different? Size, color, texture, placement? Currently, Kinders are learned about texture, both implied and real. 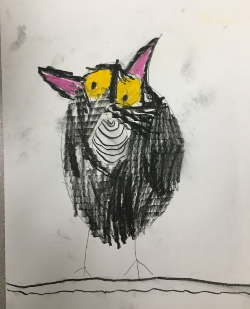 We made texture rubbings and then drew owls using textures in the classroom to fill in the fluffy feathers. Observing how O’Keeffe’s paintings filled the page. Her subject was big! Her paintings included a foreground, mid-ground and background. 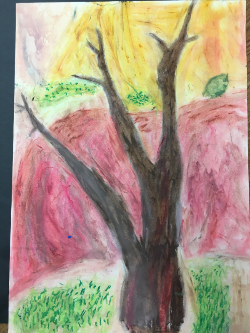 Learned techniques to show foreground and background using watercolor paints. Next, first graders learned about owls and talked about how feather make patterns. 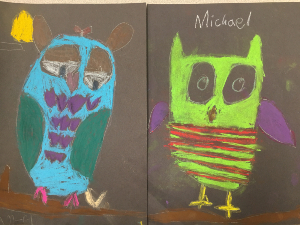 Students designed their own owls including the important parts of the owl. Describe how Georgia O’Keeffe used positive and negative space. How can you tell if a work of art is from a different time or place? What is the subject of the painting? 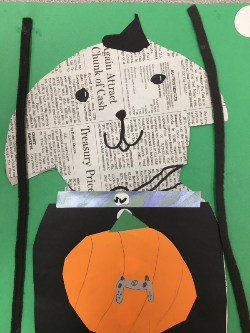 October’s first project was a collage pet portrait. Second graders discussed what a portrait is and how it is different than a self-portrait. We learned and had fun with creating art with cut paper. What did Georgia O’Keeffe communicate in her art? How do artists show space in a painting? What is a horizon line? Third graders discussed what a portrait is and how it is different than a self-portrait. We learned and had fun with creating art with cut paper. What is the subject of a work of art? What were Georgia O'Keeffe's subjects? How can the artists emphasise the subject? What are the qualities of oil pastels? 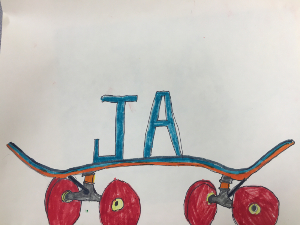 Fourth graders learned how to make block and bubble letters and then created logo designs using their initials for their portfolios. Next fourth graders reviewed different kinds of bridges that they are learning about in Tech: tress, suspension, beam bridge, arch bridge. Student are creating silhouettes of bridges against a watercolor background. How did she use texture in her paintings? Fifth graders learned how to make block and bubble letters and then created logo designs using their initials for their portfolios. Currently we are learning about one-point perspective. Students are drawing skyscrapers from the street looking up. I am really enjoying your students and the Lenski community. I would love some help hanging and taking down artwork outside of grade level classrooms. If you are interested, look for an upcoming invitation from Sign Up Genius.